If you've ever paddled the scenic rivers of Canada, you'll know that there's almost no better way to experience the breathtaking wilderness and pristine natural beauty and wildlife. If you haven't yet had a chance to canoe Canada - it's an experience you'll never forget. Whether you want to paddle through the tourmaline-colored rivers of the Western Canadian Rocky Mountains or relaxing sightseeing paddle on Canada's famous lakes - let Fresh Tracks help you discover the unparalleled scenic beauty with the perfect Canada Canoe trip. If you've dreamed of canoeing the remote northern wilderness, an adventure in Manitoba's Seal River is an exhilarating experience on a completely undeveloped, wild and rugged river that went completely untouched by the fur trade exploration at the turn of the century. While canoeing the Seal River you can paddle exciting rapids, float past Harbor Seals, fish for countless grayling, or relax on beautiful sand beaches. In addition, you can also hike the endless eskers and discover numerous prehistoric archeological sites, or take a beluga whale watching tour upon arriving in Churchill. No matter what you plan to discover on the Seal River - the possibilities are endless! If you prefer the rugged Canadian Shield, consider a canoeing adventure on the Bloodvein River. Named for the red granite running through the bedrock, the Bloodvein slashes through the Canadian Shield, tumbling over boulder-strewn rapids and surging through narrow gorges on its journey to Lake Winnipeg. While paddling the Bloodvine River you'll find endless forests of jack pine, wild rice marshes, bald eagles, black bear and northern pike eager to strike. If you interested in experiencing the rich history of Manitoba, Canada - the Hayes River carries paddlers back to the birth of Canada's fur trade at York Factory. For one of the ultimate lake canoeing adventures in the rugged alpine country of British Columbia, explore the epic splendor and pristine wildlife of Bowron Lakes. 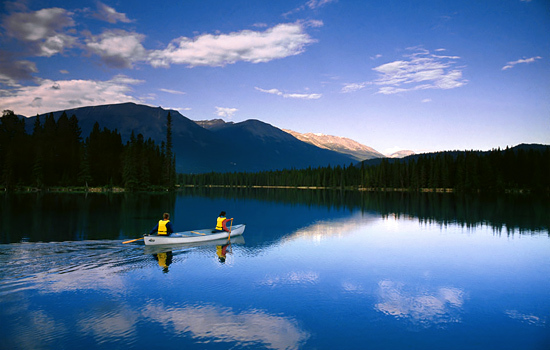 The Bowron Lakes are considered the quintessential lake canoeing experience in Western Canada. The 116 km route, through the Caribou Mountains, is comprised of 6 major lakes and a series of connecting streams, rivers and portages. The portages of the Bowron Lakes are made easier through the use of specially designed carts which allow canoes and equipment to be wheeled between lakes. Besides its natural beauty, the Bowron Lakes are a wildlife sanctuary. Paddlers often see beavers, bears, otters, and moose feeding by the waterways. In addition, the Bowron River estuary is a birdwatcher's paradise with an immense variety of bird life, including coots, mergansers, widgeon, mallards and Canadian geese. No matter where you decide to go for your next Canada canoe adventure, Fresh Tracks will help you discover the wildlife adventure of your dreams. Need more information on Canoe tours in Canada? Talk to one of our Canadian travel Insiders who'd be happy to answer all your questions.